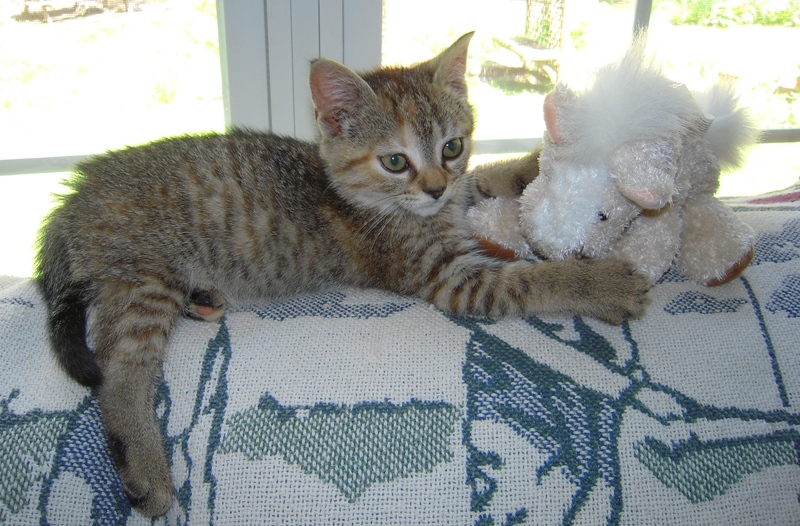 Having written A Berkshire Tale with a kitten, ZuZu, as the main character (ZuZu is my own little tabby I rescued from under a barn. 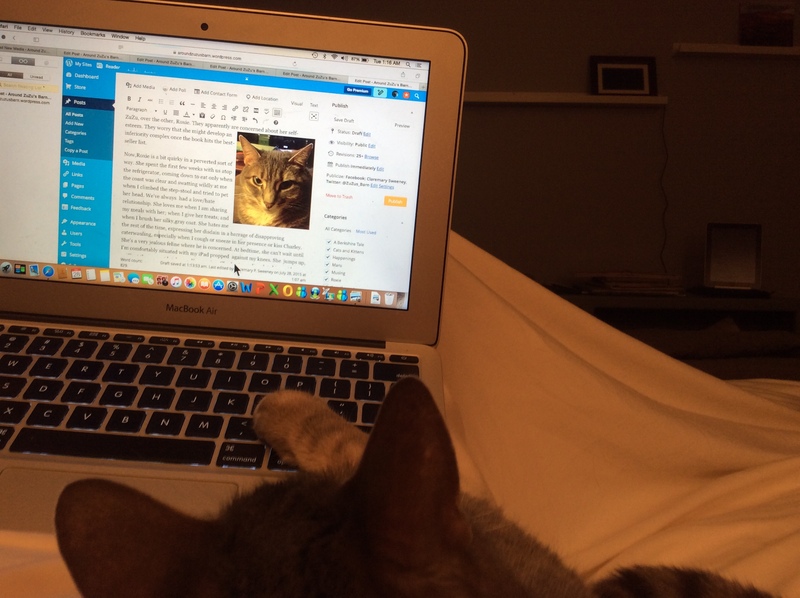 ), I’ve found whenever I write a post with a feline tag, cat lovers tune in. They are a loyal audience. So, today I’m writing just for them. Often, people who know me and who read A Berkshire Tale solemnly advise that I should write about “the other cat”. They seem to feel I’m favoring one furry child, ZuZu, over the other, Roxie. They apparently are concerned about her self-esteem. They worry she might develop an inferiority complex once the book hits the best-seller list. Now,Roxie is a bit quirky in a perverted sort of way. She spent the first few weeks with us atop the refrigerator, swatting wildly at me when I climbed the step-stool to pet her head and coming down to eat at night only when the coast was clear. We’ve always had a love/hate relationship. She loves me when I’m sharing my meals with her; when I give her treats; and when I brush her silky, gray coat. She hates me the rest of the time, expressing her disdain in a barrage of disapproving caterwauling, especially when I cough or sneeze in her presence or kiss Charley. She’s a very jealous feline where he is concerned. At bedtime, she can’t wait until I’m comfortably situated with my iPad propped against my knees. She jumps up, sniffs at the current book or golf magazine Charley is reading, lets him pet her head and then plops down beside me waiting impatiently for the show to begin. Roxie adores YouTube videos of other cats. Her very favorite is Maru. She purrs anxiously when Maru gets into predicaments that no respectable cat would ever get into. She quiets down as soon as Maru eventually manages to escape. She gently touches the screen stroking Maru’s pudgy, serious, little face. When I try to turn off the iPad to go to sleep, she usually bites me. Sometimes she bites me just because the spirit moves her and I am near at hand. Roxie could watch cat videos well into the early morning hours. Lately she’s taken to lying in wait until I’m heading outside with my hands full. As soon as she sees me re-filling the hummingbird feeder, she disappears until I open the door. Then she comes from out of nowhere and escapes. We invariably engage in a lively game of tag (I’m always It) for an hour or so until I’m on the verge of a stroke and she’s exhausted, panting and prostrate in one of the gardens.We live across from a wildlife sanctuary. There are fox, red-tailed hawks, owls, and a fisher cat in the woods around our vernal pool. They would just love to make her their entree of the week. I’ve mentioned to my concerned friends that this could possibly make a gripping tale, ending tragically with Roxie being carried off in the talons of some wild bird. They are appalled. But, I explain that if she keeps escaping, this very well could become the concluding chapter to an extremely short biography. She doesn’t realize how vulnerable she is as she flits around the yard, looking over her shoulder to make sure I’m still in the game. I’ll admit there are times when I think I should just give up and go inside for a nap. I rationalize that ZuZu would love to be an only child. I never do. Charley would be heartbroken if Roxie wasn’t there to meet him with a favorite toy every time he comes through the door. They are a mutual admiration society. 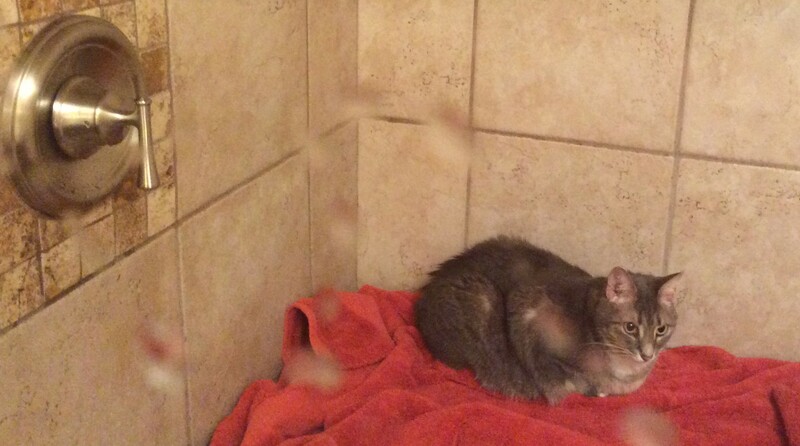 She enjoys coming into the glassed-in shower stall to observe me washing my hair although she’s not very appreciative when I try to lather behind her ears with the loofah. If I close her out, she perches on the cabinet and peers angrily in at me ala Norman Bates. I never turn my back on her and usually clear off a bit of the steam on the glass so I can be sure of where she is at all times. 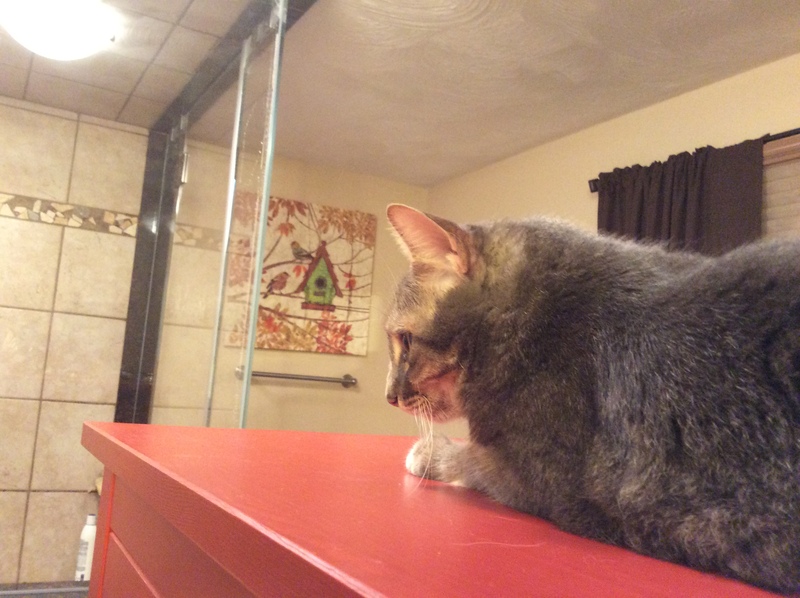 Last night I closed the door of the stall and left her in there mesmerized by the drips from the shower head. Charley was not amused when he found her looking out at him brushing his teeth before bedtime. “What were you thinking?” he asked as he carried her to bed in his arms. “She likes it in there,” I murmured, shrugging as I edited my blog page. She rubbed her jaw against my lap top, nudged it around, then proceeded to chew on the corner, apparently disgruntled to find I was writing yet another blog post even though I explained that this one was about her. She flopped down next to me with a heavy sigh and tried to type in “Maru” on the screen. I lifted her paw from the keys and then she bit me. I’ve come to the conclusion she loves Charley and merely tolerates me for my entertainment value. I can live with that. The Other Cat Is In the Dog House! What a pretty kitty ..
She is quite lovely and lovable, too. But Charley is definitely the center of her world and you can hear her purrs all over the house when he comes home. She can’t drop enough toys at his feet. Although, once she did bring me a dead mouse! Loved it! Such a character! She really is! When she first came to us, she hid for months, but with a lot of love, she’s the first at the door whenever there is a knock. Right now she’s on Charley’s chest, staring adoringly into his eyes. Gotta love her! lol my cats love my husband, there is just something about him… He says he’s a dog person but he loves his little girls (kitties)! Charley has a very calming personality and I think animals can sense they’re safe around him. Probably the same with your hubby. Sleep tight, Katherine. Yes, Roxie and ZuZu make us laugh every single day even when they are at their most mischievous. I know that you are a cat lover, too, so I’m glad you enjoyed my latest post. Wow, what a personality this cat has. I bet there is never a dull moment when Roxie is around. Great story. She’s one of those personalities that are innately funny without really trying. Sometimes Charley and I hold our sides because she makes us laugh so hard. I’ll reward her tonight with some Maru videos. Just read about your day. Sounds like you’re enjoying your new job. That’s great! And yes, Roxie is the epitome of smugness and self-satisfaction! Glad to hear that. Have a fun day! Aw, I love this. Tell Charley to give Roxie a pet for me. (I’d ask you, but she’d just bite you.) Now I’m off to go learn more about this Maru cat. I’m hoping that my cat Katie will fall in love with Maru and we can begin a new nighttime routine that does not involve her bathing my chin and drooling in my ear. Drool is such a beautiful word when a loving pet’s tongue is at the heart of the matter. On the other hand…..
Bravo! Of the dozen blogs I found through the Blogging 101 class, yours is hands down the most entertaining. Yes, I am a cat person but I am also a fan of good lively writing. Much fun. Thanks, Ann. I’ve only been blogging for a few months and as I’ve said before, writing is my string point, technology is at the other end of the scales! You have such a great storytelling voice!I enjoyed your post. I relate to it so much. Especially Roxie watching–and pawing–videos! Our other cat, Sam, does a similar thing. Enjoyed taking blogging 101 with you. Looking forward to more cat hijinks! Great post! 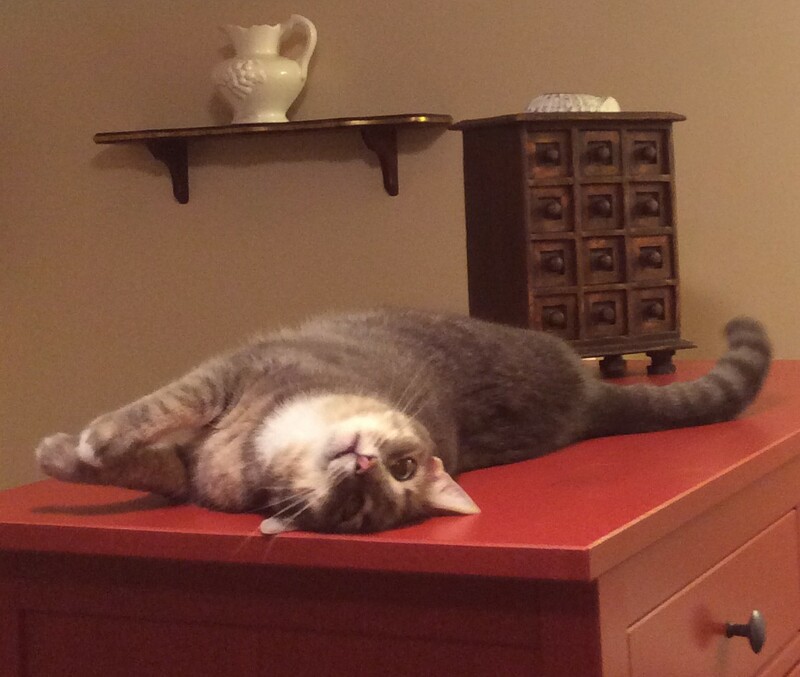 Cats have their own brand of crazy, don’t they? We have three, and they keep us on our toes. Your cats are wonderful, too. Stay cool! Thank you. Roxie is a keyboard sitter, too. ZuZu is much better behaved even though she was born in a barn. I’m not really an artist, but I needed to illustrate my book, A Berkshire Tale,quickly, and had no illustrator at the time. So, I apped the photos I’d taken in doing research for the ten stories. Stil looking for that illusive illustrator, but taking my own photos for back-up. I love tortoiseshells. My favorite kitty, Georgie ( a tortoiseshell) was a one-woman cat and she had the greatest personality. I’ll bet Kendall is much like she was. She is so cute, and the video was marvelous. Yes, she does have a sweet look to her. I’m actually going to write another post about her tonight,because she has been up to her mischief again! Thanks, It’s my first attempt at linking a YouTube video! I was shocked when I went to View Site and there it was! Who knew? I have yet to post a video. You were good. I try to get the know how from my daughter. I am with her now for another one week, and then I will be back to Houston. I have learnt from her how to do it, and upload it to my site, but I have yet to do it. I’ll be watching for that first one.Then it will be old hat and we’ll have to learn something else. I may just stop and become complacent. Works for me! Yes, her ‘tude is “Bite Me!” Literally! I should have stay in bed today as it is not my day. I went to answe your comment and it disappeared on me. No I try to read Louise Penny out order and was lost. I wanted to read her story from the first book that is on my to do list. Checked my site for dogs and again for cats. You will find plenty of animal stories. This blog post gave me lots of chuckles. I know you will enjoy reading it as well. Thank you for reblogging this post. It’s the result of appeasing some of my fellow bloggers who, on reading my bio, discovered I had another cat (Roxie). I’ve written a book about little ZuZu called A Berkshire Tale and people are concerned about Roxie’s ego. So, I started “The Other Cat” posts for Roxie to express her thoughts. I’m glad you enjoyed this introduction into Roxie’s world. They are so fun! Each one has a different personality. Who said all cats are alike. Obviously they never met one! Your cats are wonderful and I have so many of your posts about them to catch up on. Glad to meet you, even if it is a bit late. Awww thanks! Each one is different. They all have their stories. Hazel fell out of a second story window. Jake was diabetic and increasingly cranky. Morgan with her one-eye is a hoot and Mollie, the sweet 7 lb. alpha cat who runs it all. I’m getting to know them all and understand how you were taken by them.I also loved the little gray baby who only stayed for 4 days . That was 5 or 6 years ago and I found out from the friend who arranged the adoption that he’s doing fine and still with the family. Yay! He was so friendly. Job well-done. Win/win all around.